A few years ago I had my hair dyed blonde ombré from dark brown and unfortunately I was hugely unlucky with the salon I went to. They absolutely butched my hair by leaving in the bleach lightener for seven hours over two days! My hair had never been dyed before this, so I had no clue as to what should have been going on. Due to my hair being so damaged I depended upon leave in conditioners to stop the ends breaking off. I didn't want to spend a fortune and so tried a number of high street brands. So here's a review of the best and worst I found. I found one I absolutely loved which is the herbal essences bee strong leave in conditioner. It left my blonde ends soft, shiny and manageable. It stopped my hair getting dry and prevented the ends snapping off when I brushed it. It costs around £3.99 in Superdrug and is often included in offers. One bottle would last me around a month, with me using it just on the bottom half of my hair nearly everyday. The downside of using a cheaper leave in conditioner is that they often contain silicones that coat the hair strands and that's what makes them so shiny. So I would definitely recommend using a cleansing hair treatment every two weeks to counter this. However if you have damaged hair and can't bare to cut it but are on a budget. Herbal essences bee strong leave in conditioner is definitely going to become your best friend! On my search I also found one I absolutely hated. 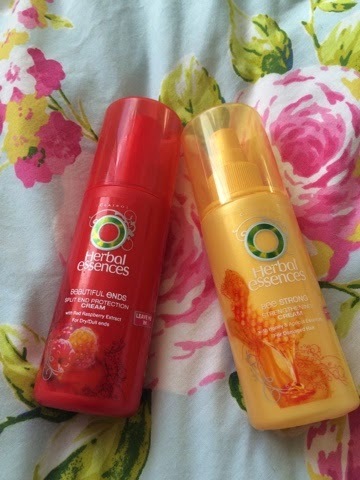 Which is the beautiful ends split end protection by herbal essences. I was shocked to find that my favourite and least favourite leave in conditioner were from the same brand! I found the beautiful ends solution was too thick and sticky, leaving my hair looking greasy no matter how little I used. To further annoy me when it was washed out my ends felt drier than ever! I would definitely avoid this one if you have fine hair like me. Although it may work better on those blessed with thick hair.